Ted Lesley of Germany devised the Working Performer's Marked Deck . The system used is nothing short of sensational and received rave reviews when it first appeared. This ebook provides you with full details of how to make up your own Working Performer's Marked Deck . 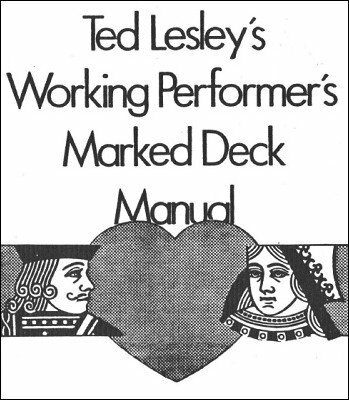 And it also includes details of twenty ideas and routines using the Working Performer's Marked Deck . Contributors to the book include Ted Lesley, Al Koran, Eckhard Boettcher, Rudolf Braunmüller, Ken de Courcy, Sam Dalal, Roger Crosthwaite and David Britland. 1st edition 1983, updated 1993, 1st digital edition 2014, 42 pages.